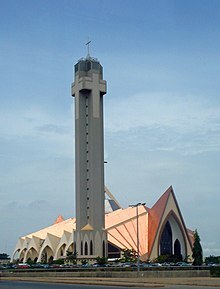 The National Church of Nigeria (previously known as the National Ecumenical Centre and officially known as the National Christian Centre) is the primary Christian place of worship in Nigeria, a country with a substantial Christian population. It is located in Abuja, the capital city. The National Church of Nigeria is an inter-denominational church building. The church was designed in a Postmodern version of the Neo-gothic style by Nigerian architectural firm, Darchiwork Group; located in Lagos. It built by Italian construction firm Gitto Costruzioni Generali Nigeria Ltd. The project was started around 1989, then lay dormant for several years until 2004, when the Christian Association of Nigeria organized a committee to ensure its speedy completion. The dedication, on 2 October 2005, coincided with the celebration of Nigeria’s 45th anniversary as an independent nation. The dedication service was presided over by the Most Reverend Peter Akinola, the Anglican Primate of Nigeria. The church is built in a neo-gothic style and has several pivoted arches with a wide nave leading to the altar. The altar, placed at the centre of the church completes a full rotation every ten minutes. A pipe organ is fitted to the right wing of the church, close to which sits the choir. Stained glass windows which employ a simple but attractive mix of yellow, green and red colours can be seen all around the church. When not being used for Christian ceremonies, it is open to the public. Guided tours are available for anyone interested in having a look. In some cases, members of the public are only allowed to tour the church when accompanied by a guide. ^ "National Ecumenical Centre dedicated in Abuja". Church of Nigeria. Archived from the original on 2011-06-28. Wikimedia Commons has media related to National Church of Nigeria. This page was last edited on 8 January 2019, at 21:28 (UTC).